A pro-business group released a report last week, saying the California Public Employees Retirement System (CalPERS) is too concerned about going green than it is about making green. The American Council for Capital Formation (ACCF) said CalPERS board members have overemphasized what are called Environmental, Social and Governance (ESG) investments — and the sluggish returns on those investments are dragging down the pension fund’s bottom line. CalPERS officials fired back, defending the financial stability of the fund and the rationale for ESG investments. Established in 1932, the California Public Employees Retirement System (CalPERS) is the nation's largest public pension fund, covering 1.8 million public workers and retirees in California. Earlier this year, the fund reported $326 billion in market value. But the ACCF report, pointing at CalPERS’ annual report released last month, said the pension fund’s future liability exceeds its assets by $138 billion. The report takes aim at CalPERS’ nine worst-performing funds, four of which were ESG investments. By contrast, the pension fund’s 25 top-performing funds were not ESG investments. ACCF criticized CalPERS investments in a number of solar panel manufacturers that soured when the market hit a glut. The report also questioned the pension board’s plans to increase climate-related shareholder proposals from 12 to 17. 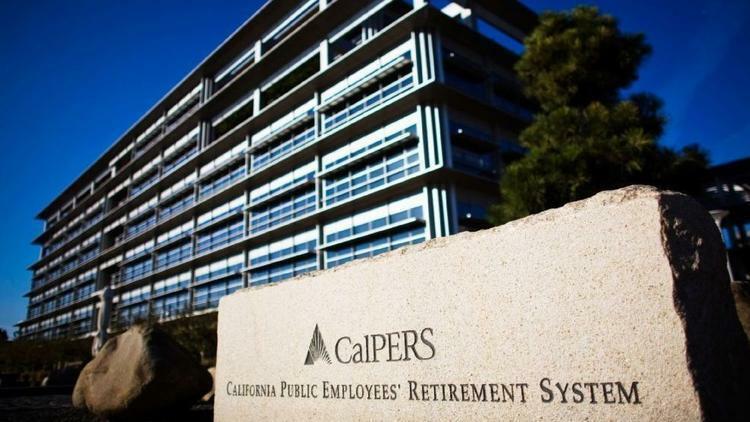 White at CalPERS said the pension fund’s board members are reflecting the wishes of its constituents. “We have successfully pushed companies to publicly report on the impact that climate change is having on their business, and we have successfully pushed them to open up their board selection process because companies with a diverse group of talented people on their boards perform better financially,” White said. ACCF said the CalPERS board’s fiduciary responsibilities should take ultimate priority because shortfalls would ultimately be borne by taxpayers. “Individual investors have every right to invest in assets, ventures or enterprises that align with causes and issues they deem worthy and important — irrespective of expectations on returns or long-term performance. After all, it’s their money,” the report said. Ironically, the ACCF report comes at a time when CalPERS has been criticized by some for not taking a more aggressive stance on environmental, political and social issues. Activists and some Democrats in the California Statehouse earlier this year called on CalPERS to divest from some companies with investments in projects ranging from the Dakota Access Pipeline to President Donald Trump’s plans to build a border wall. CalPERS has already stopped investing in coal and tobacco interests. The report on CalPERS published by the American Council for Capital Formation (ACCF) is available here. I read it and to be honest, I thought it wasn't that good and took issue with its wider condemnation of Environmental, Social and Governance (ESG) investments. Did CalPERS make dubious investments in some public solar companies? Sure it did, so what? I remember some of these companies because I used to invest in solar stocks and got clobbered, especially with smaller Chinese solar companies. However, to go from there to say ESG investments aren't worthwhile is just plain wrong. Maybe CalPERS' investments were wrong and its senior managers should have focused their attention on renewable energy projects across public and private markets that made great long-term sense. The problem is police officers, firefighters, and other public sector workers in California read these reports and come away frustrated thinking why is CalPERS investing in the ESG space? Again, I want to emphasize, the problem isn't with ESG investments because when done properly, you can make great long-term returns and meet and exceed your pension's target rate-of-return. CalPERS has already divested from coal and tobacco. In fact, when OPTrust recently divested from tobacco, they told me CalPERS and AIMCo had already decided to divest from tobacco. Like CalPERS, OPTrust is fully committed to ESG investments, and takes it seriously. In January, it released Climate Change: Delivering on Disclosure, a position paper that details the fund’s approach to navigating the complexities of climate change with respect to institutional investing and includes a call for collaboration in the development of standardized measures for carbon disclosure. The position paper was accompanied by a report by Mercer titled OPTrust: Portfolio Climate Risk Assessment which provides an assessment and analysis of the organization’s climate risk exposure across the total fund. Unlike CalPERS, OPTrust hasn't divested from coal and it takes a much more careful approach to divestments because its first focus is maintaining its fully-funded status. I discussed this issue of divesting from coal yesterday in my comment on Canada's large pension polluters and went over my thoughts why it's important to understand that each pension is different and its first mandate is to act in the best interests of its beneficiaries, not to invest in ways that conform to official government policy (which they do take into consideration). Environmental activists have an agenda, an ax to grind, but I think their approach is all wrong and they don't understand the role of a pension. A pension plan is there to ensure all their members retire in dignity and security, not to save the whales or trees. I'm not saying this in a mocking tone but that's the truth, pensions are not there to save the world, they serve a very specific function and their first priority needs to be to their beneficiaries. Does this mean public pension funds can't take a more activist role in climate change or invest in ESG investments and be more engaged in making it a better world? Of course not, the world is changing and all pensions will need to evolve as global environmental policy changes and impacts their investments. But I think it's critically important to understand, public pensions aren't an extension of government, at least not here in Canada, which is why most of them are fully funded and have great long-term track records. And every pension plan is different and can't adopt the same investment stance that others do. In the US, there is way too much government interference and the case of CalPERS having to bend over backward to appease everyone is a case in point. I'm all for a clean environment but I'm very careful and measured in my comments when discussing pensions and environmental policies because I understand their main focus is to deliver the highest return without taking undue risk with the ultimate goal of achieving and maintaining a fully funded status. Below, Jim Auck, treasurer of the Corona Police Officers Association, told the CalPERS board on May 17, 2017 that the union opposes calls to divest in certain industries, such as tobacco and fossil fuels. The message is simple, before CalPERS can save the world, public workers want it to save their pensions. You might not agree with this, but it's their pension and they have every right to voice their concern over investment decisions impacting the fund's long-term performance.